The DHS Eagles court sport teams tamed the Beaver Brae Broncos yesterday as all four teams came out on top in league play. The Senior Boys fell behind 2-0 but dug deep and fought back with 25-20, 25-19 and 15-10 wins, handing the Broncos their first loss of the season. Coach McMaster said that the team “started off slow in the first set with Beaver Brae winning 25-12, came out a bit stronger in the second set, but went into the third set down 2 sets to none.” She says the team managed to come out strong off the start of the third set, with improved digging and blocking slowing down the Beaver Brae attack. “We were offensively much stronger this week and did an excellent job with our communication and coming together as a team” said Coach McMaster. The Junior Boys cruised to a straight sets victory. Coach McMaster said that the boys “did a great job of putting on pressure offensively and keeping their focus while serving.” Moving forward, she hopes to work on “keeping fast on defense” to see continues improvement. The Senior Girls basketball team came out 31-23 over the Broncos. Melissa Felske was the top scorer with 13. The Junior Girls held off a feisty Broncos team, with a final score of 25-14. 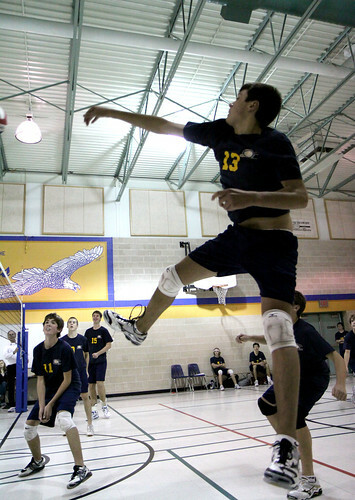 Both boys volleyball teams are participating in a tournament at home this weekend. The Senior Girls head off to Winnipeg while the Junior Girls are in Fort Frances for tournament play. Don’t miss the final Eagles home football game of the year today at 3:00 at Harry McMaster field!